We’ve been on a little bit of a soup kick lately at the Griffin household. Not really sure why. It hasn’t really been cold enough, but for some reason we’ve just been craving it. 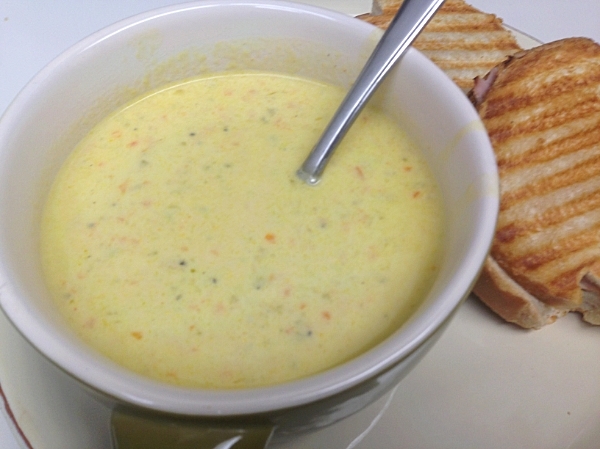 This week, Mrs. G wanted to try and recreate a cream of jalapeno soup from the Blue Quail Deli located the quaint downtown district of Goliad, Texas. She’s tried to make a few different versions over the years. Some closer than others, but I think she nailed it with this one. I’ll hand the blog over to her so she can tell you all about it. “There’s a great deli called The Blue Quail in Goliad, Tx, where our family ranch is and they make a dynamite cream of jalapeño soup. It’s a bowl of spicy, cheesy goodness that I must have when I’m in town. My mom, sister and I love to go shopping at the cute downtown square and stop in for a light lunch…especially during fall and winter because this soup really warms you up on a cold day! We’ve been going there for years and we usually buy a quart of soup to take home with us for later. That’s how good it is! It’s been my goal to replicate their recipe and I think I finally have….Well, I’m pretty darn close anyway. The Blue Quail soup packs more of a punch in the heat department…too much in my opinion. I would probably use the seeds of one or two jalapeños next time but not enough that I need a tissue while eating it like I do with their soup. The great thing is you can control the heat level to your tastes. Mr. G and I will be at the ranch over Thanksgiving and Christmas so I do plan on stopping by The Blue Quail and grilling them on their famous Cream of Jalapeño soup. They don’t like to give away any secrets, that’s for sure. Allright, I’m back now and I know what you are probably thinking. 5 jalapenos? Wouldn’t that be a spicy soup? We actually only used 4 and once you remove the seeds and membranes, you’ve removed a majority of the heat. This soup was not spicy at all. In fact, we ended up adding some cayenne, ancho and chipotle powder to add extra heat. Let’s get on with the recipe, now. Grate about two cups of cheese,around 16 oz (We’ve talked about using pre-shredded cheeses before. They are coated with “stuff” to prevent them from clumping in the bag. This “stuff” also prevents them from melting smoothly and will cause your soup to be grainy. Do NOT use pre-shredded, especially in this soup). Cut the tops off the jalapenos and remove the seeds and veins. 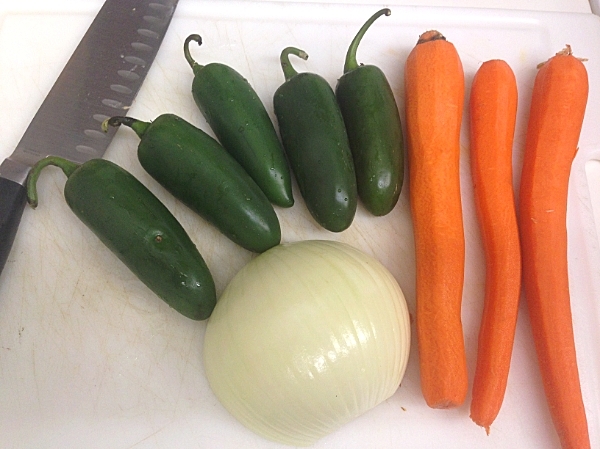 Roughly chop up the jalapenos, carrots and onion. 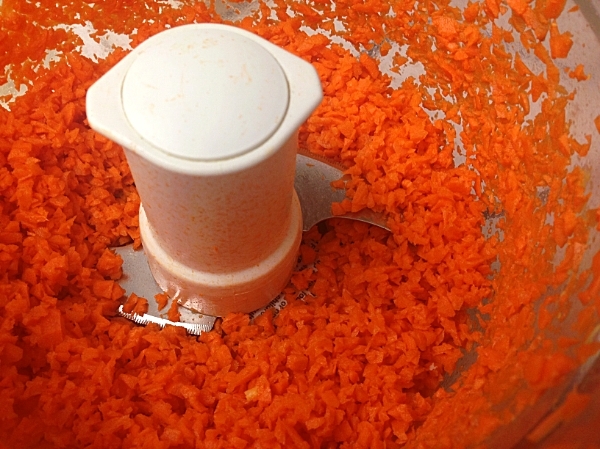 Toss the carrots into a food processor and pulse until you reach the consistency in the above picture. Remove the carrots into a skillet and repeat the process with the jalapenos and onion. Add 1 Tbsp of butter and 1 Tbsp of olive oil and saute on medium heat until they soften. 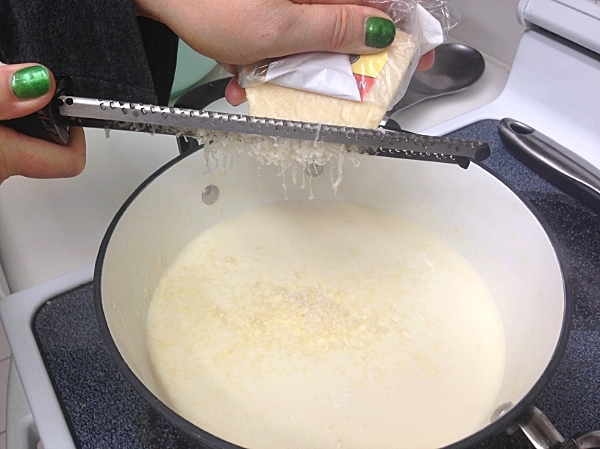 In a large stockpot, melt 3 Tbsp of butter over medium heat. Add the 3 Tbsp of flour 1 Tbsp at a time, stirring constantly until it thickens, about 5 minutes. You should have a light blonde roux at this point. Slowly add in the chicken stock and heavy cream, stirring frequently. Bring to a boil, then reduce the heat to a simmer. Stir in the shredded cheeses and freshly grated Parmesan cheese. A little bit of freshly grated Parmesan cheese always makes things taste better. Next, add in the sautéed vegetables (Do not be alarmed as the soup turns a yellowish color at this point. That is expected). Once, the veggies have been stirred in, cover the pot and turn the heat down to low and allow to cook for at least one hour. After an hour, adjust seasonings to taste. Adjust seasoning to taste after one hour. 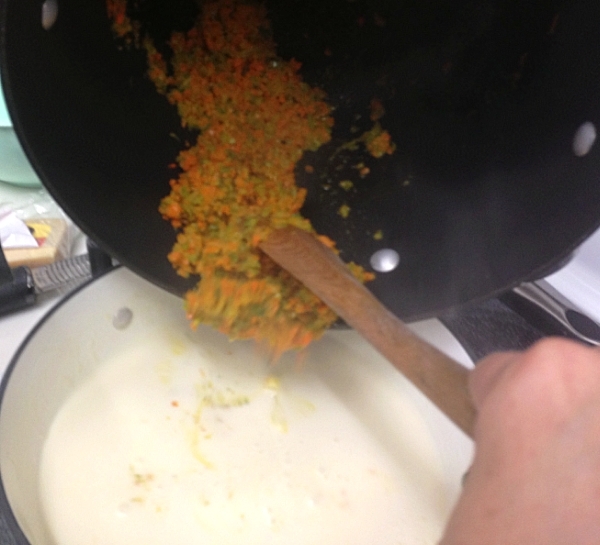 After an hour, we gave the soup a stir and noticed it had thickened up nicely. If yours still seems a bit runny, you can add another Tbsp of flour. We gave it a taste and found it to be surprisingly mild, not like the soup at the Blue Quail which can be down right too spicy on some days. To adjust, we added in a dash of cayenne and about an 1/8 tsp each of chipotle and ancho chile powder. That seemed to do the trick. Soups aren’t always the most photogenic, so you are going to have to trust me on this one. This is one killer soup. Creamy and spicy. The sweetness of the carrots add a bit of a cooling factor to offset the heat. A perfect soup to warm the body on a cold and stormy night (not that it was cold or stormy the night we made this, I’m just imagining it). 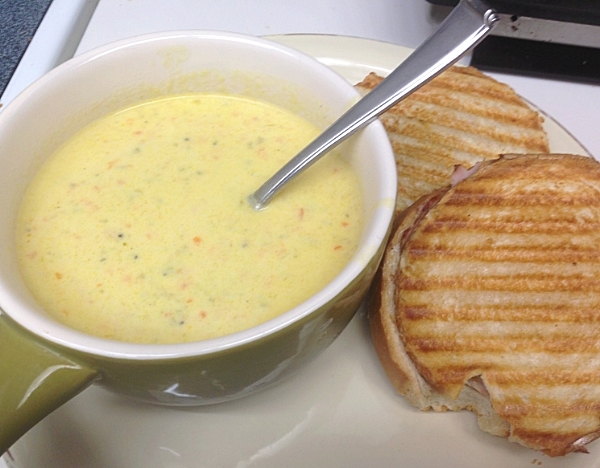 If soup isn’t enough to fill you up, serve it up with a sandwich or a Panini just like they do at the Blue Quail. And if you ever find yourself in Goliad, stop by the Blue Quail, try their Cream of Jalapeno Soup and let me know how you think it compares to our version. Try it and please let me know what you think. Having a hard time waiting the hour simmer time. I made the mistake of testing it before the simmer and now I can’t leave it alone. Absolutely fantastic. Labor intensive but totally worth it! Thanks so much for the recipe (tried this soup in Mexico last year and so happy you posted it). Suspect the cheese they are using is Pepper Bell Grn Choice from Labatt. I have no way of confirming . No account with Labatt. Hi- I’m so excited to try this soup- one question …how many servings is this for? Thank you. I’ve been wanting some of this soup! I tried it when I visited my son when he and his family lived there. You may have know him, he is a state trouper and they moved from Goliad to Austin about 2+ years ago. I always enjoyed going to Goliad! I hope you like it Kristina and it lives up to your memories of their soup. Sadly, I do not know your son. Seems like the only time we go into town while down at the ranch is for groceries or to eat. And thankfully, I’ve never been pulled over by him. Oh, I am so making this. Hubby and I will both devour it. Do you think leaving seeds and membranes in one or two of the jalapenos would do the trick next time or do you like the extra flavor that the chile powders gave? I like the extra depth of flavor from the chile powders, but if you want it hotter, for sure leave in some of the seeds and membranes. What a creative combo. I have make cream soups wiht chilies but not jalepeno. I will be trying this recipe. 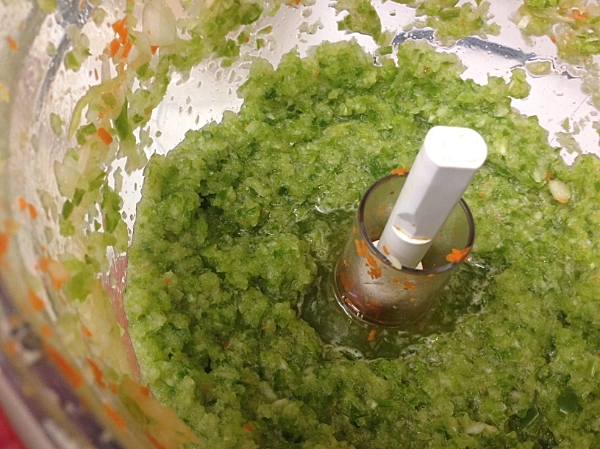 Using the food processor to extract flavor is a great technique. This looks awesome. Well done! Add some beer and you’d have a killer kicked up version of beer and cheese soup. 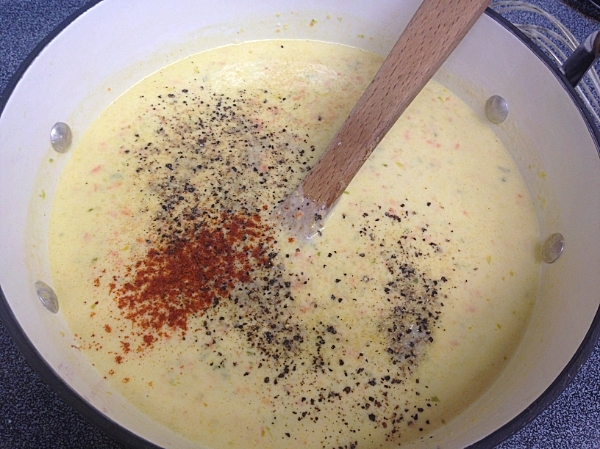 In fact, I am going to try adding jalapenos to my beer and cheese soup recipe. Thanks for the inspiration! I have not, but thanks for the tip. I won’t waste anymore Parmesan rinds, I promise. My all time favorite soup is beer cheese soup from European Street Cafe in Florida and this sounds a lot like it. I am definitely saving this to make soon. Pinning this so I’ll remember to make it soon… looks and sounds wonderful! Can’t wait to hear what you think of it, Kristi. I’m always happy to find something I’ve never even heard of before that sounds so darn good I want to make it right away! Pinning! Not a very well known soup, at least probably not that well known out of South Texas. Let me know what you think if you do try it. I made this for dinner last night. It was great! I did have to make a few changes, but only because I just wanted to use what I had on hand. I added 2 small cloves minced garlic when sautéing the veggies, along with a handful of banana peppers from the garden. I also used veggie stock so it was vegetarian. The only other change I made was to use 8oz mozzarella instead of the gruyere/sharp cheddar mix, again only because that’s what I had. I will definitely make it again! I’m glad you liked it and thank you so much for taking the time to let me know. I really do appreciate hearing feedback. The changes you made sound delicious, especially the banana peppers. Live 30 miles away and wife and I made frequent trips to Goliad JUST for the soup (Now solo). Have tried for years to get the recipe with no luck. Was told it is available if you buy the Deli for $125,000. Looking at your efforts I feel confident you are very close if not right on. Must give it a whirl. Many thanks! That would be one expensive recipe, Captain Bob. Let me know what you think once you try it. My friends (who have a ranch outside Goliad) brought the soup to us in Rockport – we love it and I decided to google and see if I could replicate – and here you are!!! Haven’t tried it yet, but will soon. Thank you. Let me know how what you think of it. Remember, leaving in the seeds and membrane of the jalapenos will make it spicier. And if this isn’t the same recipee, it’s pretty damn close! Good to hear an opinion from somebody who lives in Goliad. Glad you liked it. Haven’t made it down to the ranch this summer. Has there been any rain lately? It rained a bit in May and June, not so much in July except the weekend of Fourth of July but then it was just a drizzle. My boyfriend absolutely loved the soup, and wants me to make it every time he’s off of work. I did change it a bit, instead of a sweet onion, I used a red onion, and I made some chicken breasts to go with it. I also cut up some avocado, and then poured the soup in a bowl with the avocado and had the chicken on the side and dipped it in the soup. It was awesome! great soup, I will be making this often. 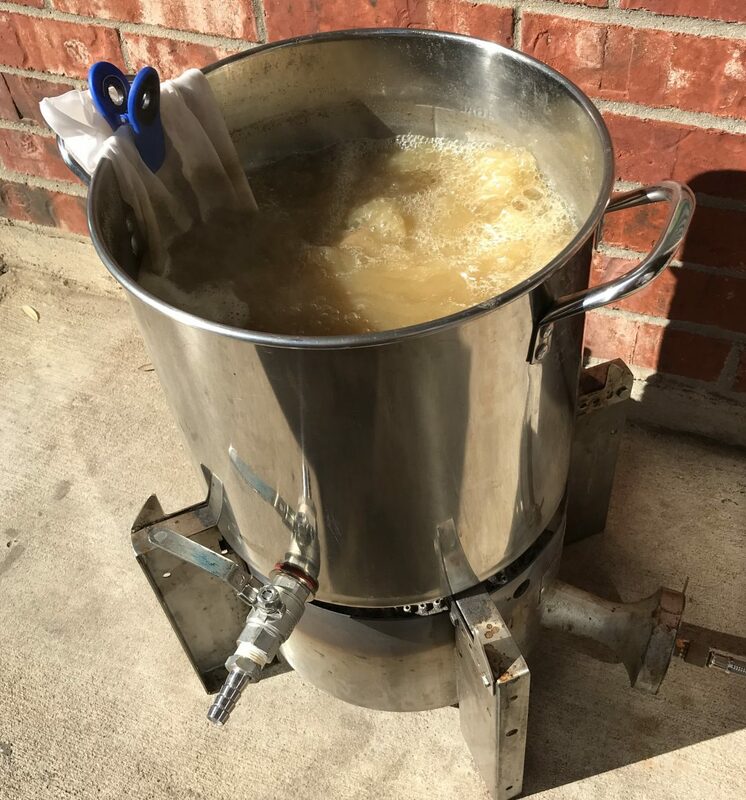 I live in a small town in north Arkansas and have been looking for a recipe for chicken jalapeno soup made at a local restaurant that went out of business. This is just about like that soup minus the chicken which I don’t mind. I did make it with a smoked gruyere so it had a bacony flavor, was was very nice. Plenty of heat without seeds or ribs I did add a little ancho chili powder. Thanks for the recipe! Glad you liked it, Cindy. The Mrs. is real proud of it. Chicken sounds like it would be a wonderful addition. I found a Cream of Jalapeño soup at the Rockyard Brewpub in Castlerock, CO and REALLY liked it – tried to replicate, but no luck. Anxious to try your recipe. If you ever happen to pass thru Castlerock, stop there and try their soup, would be interesting to see how it compares to your deli version. I do love a good brewpub. If I’m ever up that way, I’ll make sure to check it out. I CANNOT wait to try this. I, too, have been trying to copy that soup since the first time I tried it about 6 or 7 years ago, and I too have to stop and get some every time I’m in Goliad. Thank you! I’m so excited I think I may just try it tonight. So did you try it? How was it? Did you think it was close to theirs? I have not tried yet. :(. 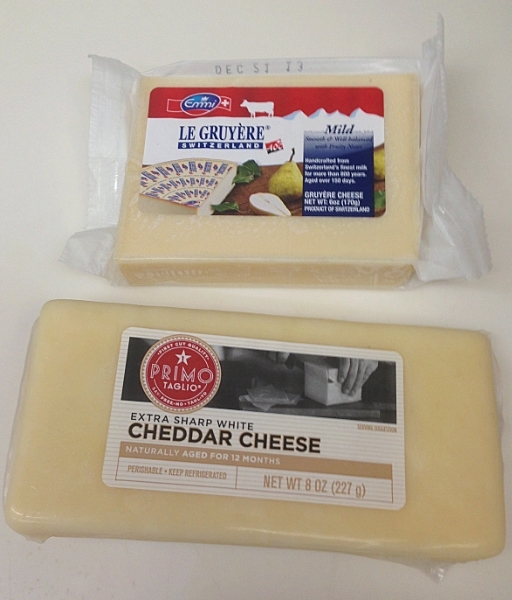 First, it took me about three weeks to be able find the gruyere…. (we are staying in Beeville at the moment and there are not a lot of options for stuff like this.) finally found some “Apple smoked” at Wally World. Then after I did find the cheese, the hubby and I took a kid free trip to Vegas. So, now I am going to make this tomorrow. My daughter had been begging for it since I found this. My daughter ate the cream of jalapeno soup at the Blue Quail and talked about how delicious it was so I decided to look up a recipe and make it.. She tasted it and said it tasted the same. I couldn’t stop eating it. Delicious!!!!!!! Thanks for the recipe. This is an awesome recipe. When I made it the first time I felt like it was missing something. This time I added an avocado I had and some tomatoes. WOW….That was DEFINITELY it. No flour was needed once it simmered. I left the seeds of one half of a small pepper and the spice was just right. I did not have any Gruyere so I used my Pepper Jack Cheese with my Extra Sharp Cheddar. OMGoodness…So so good……. Hello I’m from Refugio and like you I LOVE THE BLUE QUAIL & THE JALAPENO SOUP ! I have tried to make it also we use the same ingredients except the cheeses I used Velveeta cheese in mine because our Wonderful HEB doesn’t carry guerrier cheese! It is very close to BQ ! I live in Goliad. Use Velveeta. I have made it many times and the Velveeta is the right cheese to use.